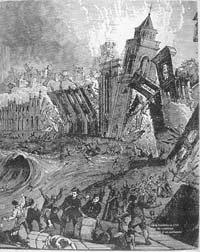 We can all recall the earthquake news stories from Japan, New Zealand, and Turkey this year and who can forget the harrowing scenes of the 2004 Boxing Day Tsunami, but for the Portuguese, the 1st November, All Saints Day, and a national holiday, will also be remembered for the devastating earthquake of 1755. 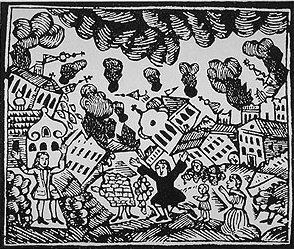 The earthquake began at 9:30 on November 1st, 1755, and was centred in the Atlantic Ocean, about 200 km WSW of Cape St. Vincent. The total duration of shaking lasted ten minutes and was comprised of three distinct jolts. Effects from the earthquake were far reaching, with the worst damage occurring in the south-west of Portugal. 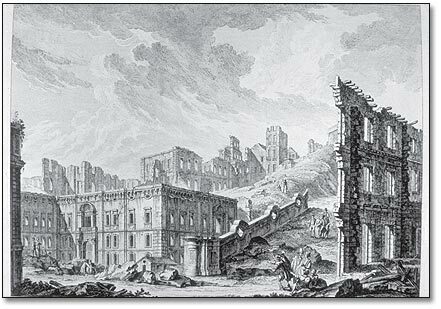 Lisbon, the Portuguese capital, was the largest and the most important of the cities damaged, and a devastating fire following the earthquake destroyed a large part of Lisbon, and a very strong tsunami caused heavy destruction along the coasts of Portugal, southwest Spain, and western Morocco. Some 90,000 people died in Lisbon, more than one third of its total population, and another 10,000 lives were lost in southwest Spain and Morocco. Lisbon was not the only Portuguese city affected by the catastrophe. Throughout the south of the country, in particular the Algarve, destruction was rampant. Almost all the coastal towns and villages of the Algarve were heavily damaged, except Faro, which was protected by the sandy banks of the Ria Formosa. In Lagos, the waves reached the top of the city walls. “There never was a finer morning seen than the 1st of November; the sun shone out in its full luster; the whole face of the sky was perfectly serene and clear; and not the least signal of warning of that approaching event, which has made this once flourishing, opulent, and, populous city, a scene of the utmost horror and desolation, except only such as served to alarm, but scarcely left a moment’s time to fly from the general destruction. … The house I was in shook with such violence, that the upper stories immediately fell; and though my apartment (which was the first floor) did not then share the same fate, yet everything was thrown out of its place in such a manner that it was with no small difficulty I kept my feet, and expected nothing less than to be soon crushed to death, as the walls continued rocking to and fro in the frightfulest manner, opening in several places; large stones falling down on every side from the cracks, and the ends of most of the rafters starting out from the roof. … I hastened out of the house and through the narrow streets, where the buildings either were down or were continually falling, and climbed over the ruins of St. Paul’s Church to get to the river’s side, where I thought I might find safety. Here I found a prodigious concourse of people of both sexes, and of all ranks and conditions, among whom I observed some of the principal canons of the patriarchal church, in their purple robes and rochets, as these all go in the habit of bishops; several priests who had run from the altars in their sacerdotal vestments in the midst of their celebrating Mass; ladies half dressed, and some without shoes; all these, whom their mutual dangers had here assembled as to a place of safety, were on their knees at prayers, with the terrors of death in their countenances, every one striking his breast and crying out incessantly, Miserecordia meu Dios! . . . In the midst of our devotions, the second great shock came on, little less violent than the first, and completed the ruin of those buildings which had been already much shattered. You may judge of the force of this shock, when I inform you it was so violent that I could scarce keep on my knees; but it was attended with some circumstances still more dreadful than the former. On a sudden I heard a general outcry, “The sea is coming in, we shall be all lost.” Upon this, turning my eyes towards the river, which in that place is nearly four miles broad, I could perceive it heaving and swelling in the most unaccountable manner, as no wind was stirring. In an instant there appeared, at some small distance, a large body of water, rising as it were like a mountain. It came on foaming and roaring, and rushed towards the shore with such impetuosity, that we all immediately ran for our lives as fast as possible; many were actually swept away, and the rest above their waist in water at a good distance from the banks. 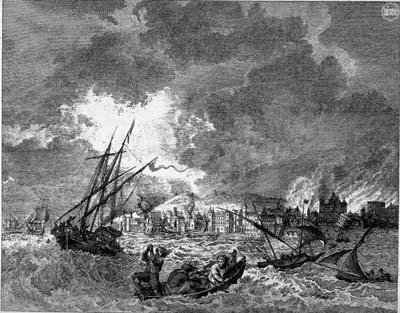 … I had not been long in the area of St. Paul’s when I felt the third shock, somewhat less violent than the two former, after which the sea rushed in again, and retired with the same rapidity, and I remained up to my knees in water. … Perhaps you may think the present doleful subject here concluded; but alas! 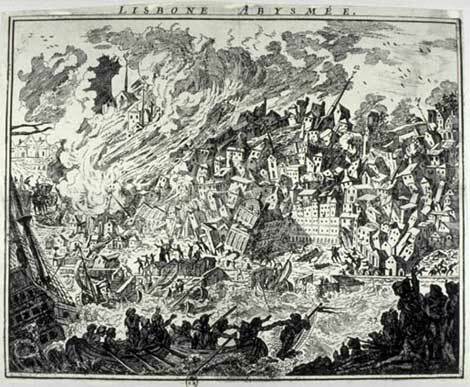 the horrors of the 1st of November are sufficient to fill a volume. As soon as it grew dark, another scene presented itself little less shocking than those already described: the whole city appeared in a blaze, which was so bright that I could easily see to read by it. It may be said without exaggeration, it was on fire at least in a hundred different places at once, and thus continued burning for six days together, without intermission, or the least attempt being made to stop its progress. “Unhappy mortals! Dark and mourning earth! The Iron laws that chain the will of God”? “God is avenged: the wage of sin is death”? My plaint is innocent, my cries are just. Whilst it might seem to be a human impulse in such circumstances to search for an explanation – a meaning – to such an event, it must surely be seen to be what it is – a natural disaster. What is important is that we can learn from such horrific events in history – and what is clear is that we need to have good preparation and clear planning in place – so that we can cope better should the nightmare ever become a reality again. This national public exercise called ‘Terramoto’ will be held in schools, shopping centres and municipal squares. The awareness raising action, promoted by the National Civil Protection Authority (ANPC), will include seven steps to inform people how they should react before, during and after an earthquake. ”At a national level it is the first time, and our ambition is for it to have a big impact on communities and citizens in various locations, especially in schools, shopping centres and wherever people are at that moment,” stated REDE member Flávio Barbini. We should remember that such events illuminate a world where community is still placed ahead of the individual, where grace and hope prevail; and pray that such an earthquake never returns to these shores; and also remember those who lost their lives, and those who re-built Lisbon and many areas of Portugal after this devastating event. Images – many period images are included on the web, generally without attribution, and from long out of print sources. Images used in this post are with recognition of this, and with gratitude. This entry was posted in Algarve, Events, Portugal and tagged 1755 earthquake. Bookmark the permalink. A lot of work has gone into this blog Aly- I’m impressed. Amazing to read these facts when you look at the lovely city that Lisbon is today. Funny, I was just thinking about All Saints- we’re usually in the Algarve for this holiday. thanks – glad you are enjoying the blog – I am finding out so many interesting things I didn’t know as I research as well – Portugal has a fantastic history. You haven’t missed much today tho – it has rained a lot and been quite grey and dreary! thanks – I enjoyed writing this post!